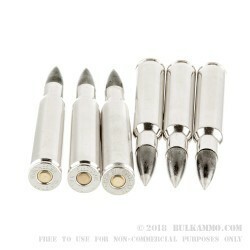 A perfect take on deer for the .30-06 when you want to ensure kills, but not overdo it. This is a nice amount of power for the ‘ought-six on moderately sized game. 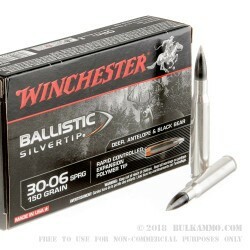 The 150 grain polymer tipped Winchester Ballistic Silvertip offers proven ballistics, great range and a nicely sized projectile weight for a wide range of activities. The regular, heavyweight rounds cannot compete as well in deer season, and still offer upper end, larger animal ballistic performance too. Solidifying the need for something like this load to be on your shelf. 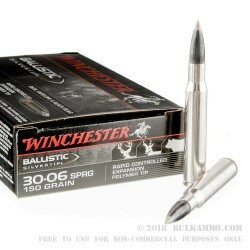 Perhaps one of the best reasons for why the .30-06 is such a mainstay for American hunters is the uncanny ability for the round to be used for everything from medium/large predators to large game like deer, elk, moose and even bear. The 150 grain projectile from a line like this Winchester Ballistic Silvertip is just such a good round to have laying around. In the field it gives you options when the scouting begins for your trophy buck because the weight of the projectile is so forgiving. 2900 feet per second muzzle velocity and 2800 ft. lbs. of energy means dropping game the size of deer where they stand, essentially every time.